Tai chi master Chen Zhenglei, born in 1949 in a village in central China’s Henan Province, is an 11th generation direct-line inheritor of Chen’s Tai Chi. He began his martial arts training at an early age. Through more than 30 years of hard work and diligence, he mastered the complete Chen’s Tai Chi system. He was officially named one of “China’s Top 10 Contemporary Martial Arts Masters.”From 1974 to 1988, he has won numerous gold medals and championship titles in national and international tournaments. His teaching career began in 1972 and now his students are spread through all provinces in China and over dozens of countries in the world. Throughout the years, he has been to dozens of countries to host workshops and seminars. Master Chen is well learned in tai chi theories. His major works include Ten Phases of Tai Chi Practice, A Collection of Chen’s Tai Chi Boxing and Weapon Routines, Chen’s Tai Chi for Health and Wellness, The Wonders of Tai Chi Kungfu. Tai chi, or taijiquan in Mandarin, is a Chinese martial art practiced for body building, self-defense and health. It combines graceful movements with deep breathing and meditation. China has recognized tai chi as a form of excellent cultural heritage and started the application process for the UNESCO World Intangible Cultural Heritage List in 2008. However, the application has not been successful so far. Also, Japan and the Republic of Korea have also put forward competing claims to be the birthplaces of tai chi. Chen Zhenglei was born in the birthplace of Chinese tai chi. He is dedicated to teaching and promoting tai chi all over the world, even in his late 60s. He hopes that more people can understand the essence of tai chi and gain the benefits of practicing it. After his return from a European tai chi workshop, Chen recently sat down with a CSST reporter and talked about the domestic and global dissemination of tai chi. CSST: The Christian Science Monitor published an article about tai chi that said Japan and the Republic of Korea also intended to apply to UNESCO, claiming tai chi as their intangible cultural heritage. What do you think of the tai chi’s application for UNESCO’s Intangible Cultural Heritage List? Chen Zhenglei: Tai chi is a crucial concept of Chinese culture and philosophy. Tai chi expresses the balance of yin and yang through body language, which is consistent with the law of nature as well as human physical and psychological requirements. In Chinese philosophy, yin and yang are two opposite but unified elements of the universe. They always maintain a balanced state. The influence of tai chi’s inclusion on the UNESCO list will be far reaching, which will greatly promote Chinese tai chi in the future. As we know, tai chi is founded on the basis of traditional Chinese culture, and it embodies the profound connotations of Oriental culture. However, if one of its variants can be included in the World Intangible Cultural Heritage List, maybe no one in the future will believe that tai chi was invented by Chinese people. As an 11th generation direct-line inheritor of Chen’s Tai Chi, I have been devoting my whole life to the cause. It is my responsibility to realize its addition to the UNESCO list. I will continue to work hard to promote tai chi until that day. CSST: Chinese martial arts movies have a huge African audience. These movies have become so popular that many Africans are coming to China to learn martial arts, including tai chi. You have just come back from a workshop in Europe. Could you talk about current global influence of tai chi? Chen Zhenglei: Since the 1980s, especially after China’s introduction of the reform and opening-up policy, international exchanges about tai chi have become increasingly frequent. There are many tai chi enthusiasts in a variety of countries and the number of foreign tai chi students in China is growing year by year. A series of tai chi organizations have been established in China and abroad in a bid to promote practices and relevant studies. Around 1,400 Chinese and Japanese performers practiced tai chi at the opening ceremony of the 1990 Beijing Asian Games, marking tai chi’s world debut. An integration of Eastern and Western cultures is taking place in the 21th century. As a representative of Oriental culture, tai chi will play an irreplaceably important role in this round of integration for its scope of expansion and increasing number of learners. I have been to more than 50 countries around the world and established over 100 tai chi teaching centers that are home to more than 800 disciples and hundreds of thousands of students. Some 300 disciples from these centers are engaged in professional tai chi teaching work. The University of California, Irvine has initiated a research project on tai chi, and many renowned schools in the world have opened teaching centers. In terms of current development trends, a China-centered global tai chi network will be formed by the mid-21st century. Its branches will extend to countries and regions such as Japan, the Republic of Korea, Southeast Asia, Australia, the United States, Britain, France, Mexico, Sweden and Finland, and seek its expansion in Africa, Central America, South America, the Middle East and Central Asia. The number of tai chi practitioners will hit 500 million at that time. If we continue these endeavors for a couple of years, tai chi will become an important part of people’s lives, thus becoming the “world’s first sport” with the largest practicing group. In 2014, I was invited by the Overseas Chinese Affairs Office under the State Council and China Overseas Exchange Association to join them on a visit to Africa for the first time. We went to South Africa, Botswana and Mauritius and opened tai chi lessons there so that the local residents can better their understanding of tai chi. Although it was my first visit to Africa, my relationship with the African learners had already begun. In addition to Chen Zhenglei Tai Chi headquarters and branches, I saw a lot of African learners at the international workshop for Chen’s Tai Chi each year. I was moved by their affection for tai chi. CSST: What’s the current situation of tai chi in China? Chen Zhenglei: Since the 1950s, tai chi has been highly valued by the Party and the government with the goal to promote public health. The National Sports Commission has organized experts to write and edit a large batch of books in order to make tai chi universal, which has laid a foundation for the development of tai chi culture. Chinese leader Deng Xiaoping wrote an inscription “tai chi is great” and bestowed it on Japanese friends on November 16, 1978. The inscription defined tai chi as the legacy of excellent Chinese culture. It also set a clear goal for tai chi in terms of dissemination, promotion and development. With the continuous improvement of people’s living standards, tai chi has become immensely popular among the public and become a public fitness exercise. At present, the annual national tai chi competition and the Wenxian International Tai Chi Covenant have attracted a great number of domestic and foreign tai chi enthusiasts, lifting the overall standards of tai chi. 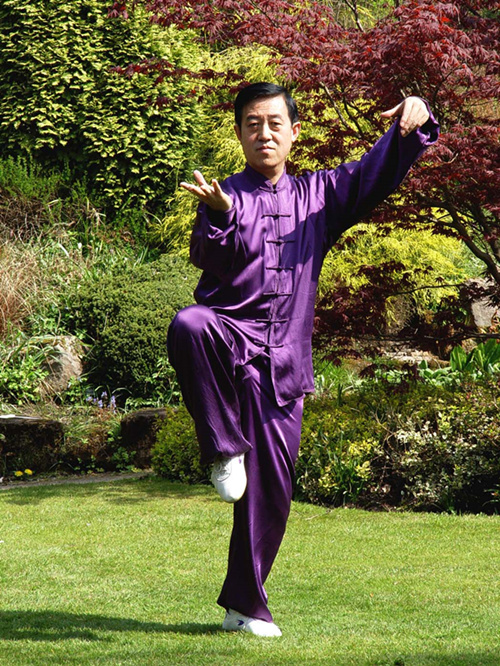 The launch and implementation of the 1995 National Fitness Program made tai chi more crucial and led to unprecedented popularity of the art domestically and overseas. Tai chi has an optimistic outlook and is entering its golden age. Since the dawn of the 21st century, the advancement of science and technology and the improvement of material life and competitive sports have driven a return to nature. Tai chi follows the laws of human physiology and the movement of nature, with an emphasis on the harmony between men and nature. Its various functions and fundamental cultural connotations meet the current requirements for health, nature and sports, reflecting a shift from physical competitiveness to natural balance. In addition, President Xi Jinping’s speech at the 2016 National Sanity and Health Conference lends support for promoting tai chi. CSST: Tai chi is considered as Oriental philosophical boxing style that contains the essence of Oriental culture and traditions of Chinese culture. It pays equal attention to physical and mental practice. What do you think of the relationship between tai chi and culture? Chen Zhenglei: That’s true. Tai chi is a treasure trove of traditional Chinese philosophy and culture. Tai chi emphasizes the communication of yin and yang because every movement embodies the two-way transformation of yin and yang. Our ancestors created this form of shadowboxing 400 years ago with a focus on vital energy and internal strength rather than ferocious movements. Tai chi is the legacy of traditional Chinese culture in the past thousands of years. People can comprehend the profound traditional Chinese culture through practicing tai chi as it overlaps with a variety of disciplines, such as philosophy, medicine, mechanics, mathematics, aesthetics, warfare, music and management. Many people may only know that tai chi reflects on tai chi culture. In fact, tai chi has too many profound implications. It is a form of valuable cultural heritage and has a close relationship with our work and life. If you take a closer look, you will find that life is filled with tai chi culture. CSST: Tai chi is not only an crucial component of traditional Chinese culture, closely connected with traditional Chinese medicine. It is safe to say that tai chi can promote physical and mental health, which facilitates its development and dissemination. Many people believe that practicing tai chi can help release the pressure of modern life. Chen Zhenglei: Currently, people advocate a “slow life” that reflects their desire to escape from overloaded and fast-paced work. Tai chi stresses the mysterious yin and yang, which are helpful for body building and stress relief. The practice of tai chi is a process of physical and mental training. Body and soul focus relief, quietness and emptiness, and the movements should be natural. People will feel physically comfortable and mentally happy after practicing tai chi for a long time. They can also get rid of an array of troublesome desires. Zhang Mengying is the reporter at the Chinese Social Sciences Today.